(CBS News) The Environmental Working Group (EWG) - a non-profit organization concerned with consumer well-being and safe products - says in its latest report that there are more safe sunscreens to use this year. The bad news? Only 25 percent of the 1,800 products the group tested were recommended by the group. In its sixth annual report, the EWG noted that there was a decrease in the use of allergy-inducing "fragrance" chemicals and oxybenzone, a hormone-disrupting chemical that mimics estrogen, compared to products on last year's list. It also reported a decrease in products containing retinyl palmitate, a synthetic form of vitamin A. Past research by the National Center for Toxicological Research and the National Toxicology program have shown that tumors in rats whose skin was covered with a cream containing retinyl palmitate grew 11 to 21 percent faster than rats who didn't have the substance, TIME reported. 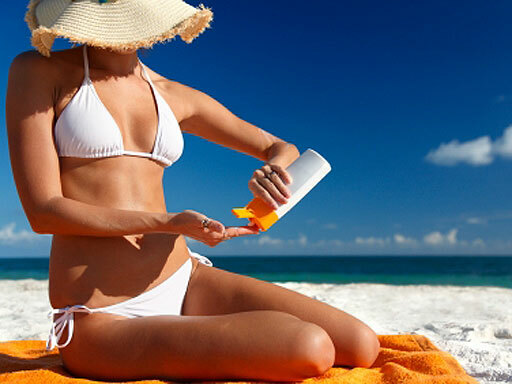 One-fourth of sunscreens contained the substance this year, as opposed to one-third last year. Also, more minerals were found in beach and sport sunscreens, which the EWG recommended as a good choice for children, people with sensitive skin and others who didn't want harmful chemicals in their products. About 60 percent of almost 180 sunscreen products marketed for children contained mineral ingredients, the EWG said, compared to 40 percent of other sunscreens. Some other concerns arose in the report. First, only half the sunscreens would pass the FDA's "broad spectrum" test. While many sunscreens contain adequate UVB protection, not that many sunscreens have proper UVA protection. Many of the products would not qualify for the European market under current regulations. UVA, which accounts for 95 percent of all radiation coming to earth, is what causes premature aging and gets deeper in the skin, according to SkinCancer.org. More recently, it has been discovered that it causes damaged skin cells in the basal layer of the skin, which is where most skin cancers occur. UVB is what causes reddening and sun burns. The Food and Drug Administration has delayed an update on sunscreen regulations that would ease confusion on how much protection sunscreens actually provide. New rules were supposed to ban all SPFs over 50 because it was hard to test their veracity, put stricter regulations on sunscreens that claimed to be water-resistant -- virtually eliminating the term water-proof -- and make companies say how effective their UVA and UVB protection was, HealthPopreported. The FDA originally wanted the updates in place for the summer in June, but now major companies have until December to comply, and smaller businesses will have another year to make sure their products are up to par. "FDA's decades of foot-dragging has brought us a marketplace of mostly subpar sunscreen products," said Environmental Working Group senior analyst Nneka Leiba, said in the press release. "While we're grateful to see the general market improve, we wish we could assure consumers that 100 percent of sunscreens sold in the US are effective and safe. We can't." The Personal Care Products Council, an industry trade group, disputes the safety allegations related to retinly palmitate and oxybenzone that are contained in the EWG's report, saying both ingredients are FDA-approved. "Consumers can be confident that sunscreen products, when used as directed and as part of an overall safe sun regimen, are safe and will help protect them from skin cancer, premature skin aging, and other damaging effects of the sun," the Council said in a statement.